Why is VicPol raiding our gun dealers and security businesses? A few months ago, The Age ran a story about a security business owner, Michael Sloan, who had 16 rifles and a shotgun which our Licensing Regulation Division of Victoria police claimed it had seized. Except that Michael had them. It was another problem with the database. The article also cited the example of another security business owner who was taking legal action for what he believed was an illegal search by the LRD, again because of data problems with the LRD. What really caught our attention though, was the passing reference in the article to ‘Operation Baffler’. The paper said the LRD had launched the operation which involved conducting raids on lawfully operated security businesses and gun dealers. So what is Operation Baffler? Sources close to the industry have said staff from Victoria Police has admitted it wants to halve the number of gun dealers from over 300 to about 150. This would cut out small, and homebased businesses many of whom provide niche markets for people like yourself. The operation is also, reportedly, aimed at tightening down on security companies who are prepared to stand up for themselves. Understanding what the purpose of the operation clearly warrants closer attention. 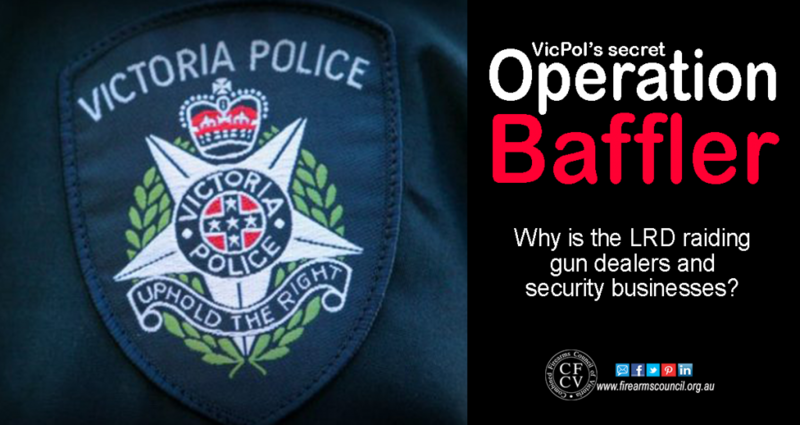 Others have tried to FOI Victoria Police for information on Operation Baffler but without success. So we’ve put our own FOI in, this time with a narrow, specific focus. The documents we seek are any documents which describe what the operation is, who it relates to and why. We’ll let you know what comes back. However if you have any more information on Operation Baffler, please feel free to let us know. Whom is up the ladder pushing/authorising VP to do this? Are they personally against lawful firearm ownership? Are they linked to the green anti`s? Remember folks. If the police succeed in banning firearms in their totality their will be no firearms in society and therefore there will be no need for police to carry firearms……… right?